Take a load of blackberries and any other edible fruits from the hedgerows. Put them in a big saucepan and add enough water to come up to just under the surface of the fruit. Bring to the boil and simmer for about 20 minutes until the fruit is soft and pulpy. Then strain the liquid through a sieve or tea-towel. To the ensuing liquid, add other fruit juices to taste, such as red grape juice, cranberry juice, apple juice or whatever takes your fancy. 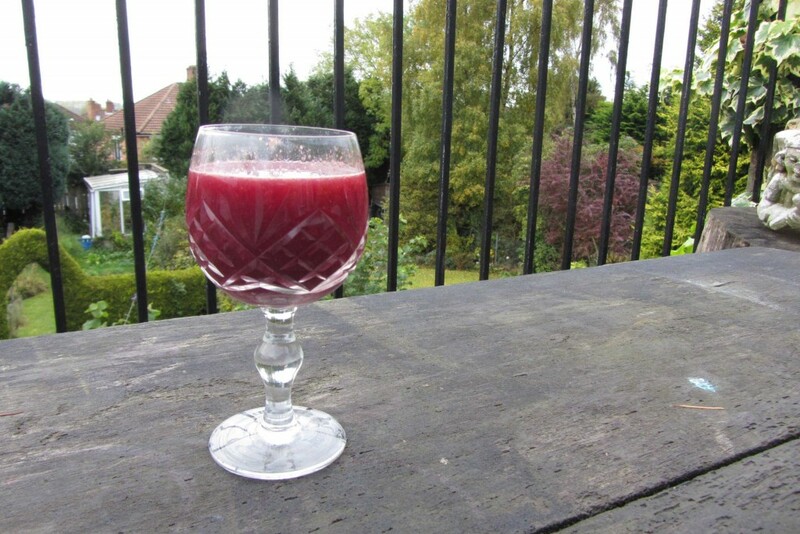 To each litre of juice, add about 250ml water, and then sugar to taste, generally about a tablespoon per litre. Heat up but don’t boil. Add spices such as cinnamon, mixed spices, cloves and/or nutmeg, about a heaped teaspoon per litre, but again try it and add more if you want. You can put loose fruit in to float about and look good, such as blackberries, or orange segments studded with cloves. For an alcoholic version, you can add red wine rather than grape juice. For Wassail at Christmas, try apple and orange juices mixed, and lots of cinnamon and cloves.